This was the second watercolor technique piece I have created and the shapes are still more geometric then I now piece such as the mountains and trees. 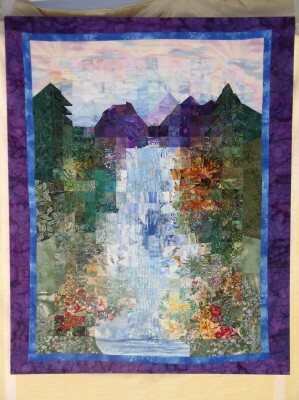 I have continued to refine the manipulation of the fabric squares to better portray nature as seen in the Tillamook Head quilt. This quilt was laid out from a sketch with 2×2 inch squares then pieced by machine, hand quilted with colored threads. After stretching the quilt on a wooden frame. I placed silver, blue, green, aqua and pearl seed beads running down the waterfall to help capture some light and simulate moving water. This quilt measures 38″ x 48″ ; was purchased by an art collector.